Badged as a cocktail bar and Chinese restaurant this third branch of Chung Ying has opened on Colmore Row in the unit previously known as Saffron Indian, which was totally dreadful. Glad to see it’s been redecorated for it’s new incarnation, although it feels a bit bare and didn’t project the luxe image that the hype suggests. As the waitress came over to take our food order, to avoid confusion, I specifically asked whether we could have starters, then duck as a separate course, then mains. This was confirmed. What followed was a comedy sketch show of Walters/Wood Two Soups proportions (see the hilarious sketch on YouTube). There arrived two of four starters, then the duck with the other two starters, then the duck was taken away and we ate the second two starters, then those we’re cleared and we were laid for mains with plates and rice bowls, then the rice bowls were removed, then the plates removed, then the duck arrived, then different new plates arrived. They were very apologetic about it. 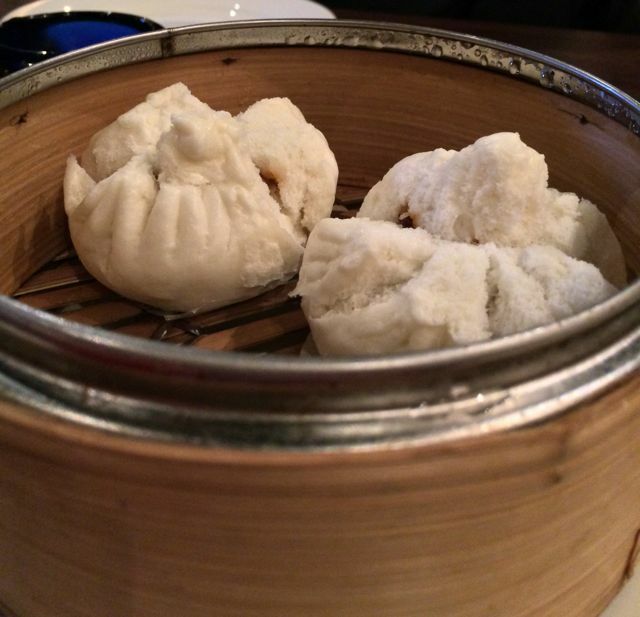 For starters I ordered steamed pork buns. If you’ve not had this dim sum before then go and try these moist fluffy sweet barbecuey porky delights, they are seriously tasty. Like delicious clouds. We also ordered Yuk Sung which was good, prawn toast, and very crispy chicken curry spring rolls. Then followed the crispy shredded duck with pancakes and accoutrements which was very well done. 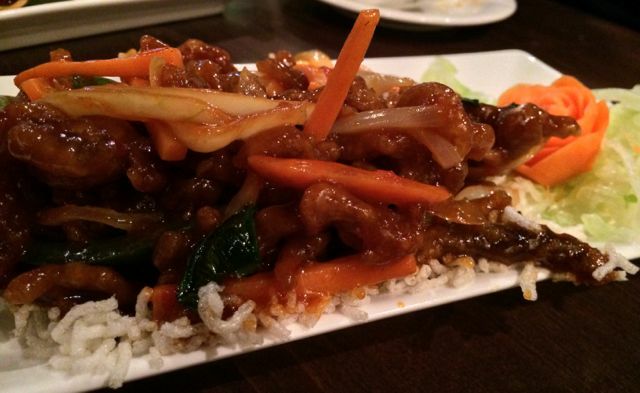 For mains we tried the crispy shredded beef. It was crisp, with a gooey sauce that tasted hot and sour. We also tried the salt and pepper chicken which had a good peppery flavour (pepper is used at its best in Chinese cookery in my opinion). Also we enjoyed the sweet and sour chicken. We had a bit of a problem with the pineapple rice, which originally arrived without the pineapple but with prawns, but was apologetically replaced – no good for a shellfish allergy though as it did have prawns in it with the pineapple – I enjoyed it however. 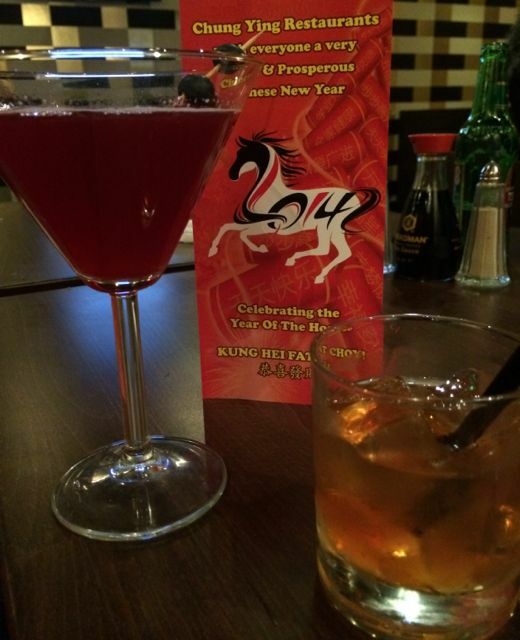 We had cocktails after dinner – they’ve got one to go with each of the Chinese zodiac signs. They were good. Although, predictably, there was a mix up between what we ordered and what we had delivered, we did get a freebie very nice old fashioned though to compensate. A large table of fifteen or so merry people provided entertainment as one of the ladies was so drunk that every time she went to the bathroom she face planted on the floor. Full on Superman style complete wipeouts. With cocktails, starters, duck, mains, rice, and beers, dinner came to about £30 a head, which I think was very reasonable for the superb quality of the food we had. Don’t get me wrong the service needs quite a bit of work, it was the day after Chinese New Year when we went, and I have to say the service was apt for the year of the pantomime horse – but the food was lovely. We will be back soon. We can’t end without these final horribly-misquoted Dickensian lines, also from The Tale of Two Cities “It is a far, far better thing that I do eating at Chung Ying Central, than I have ever done at other Chinese restaurants in Brum; it is a far, far better rest that I go to after that many beers and cocktails than I have ever known”. Update 27/02/14: We’ve been back a couple of times since and the service has been much better! 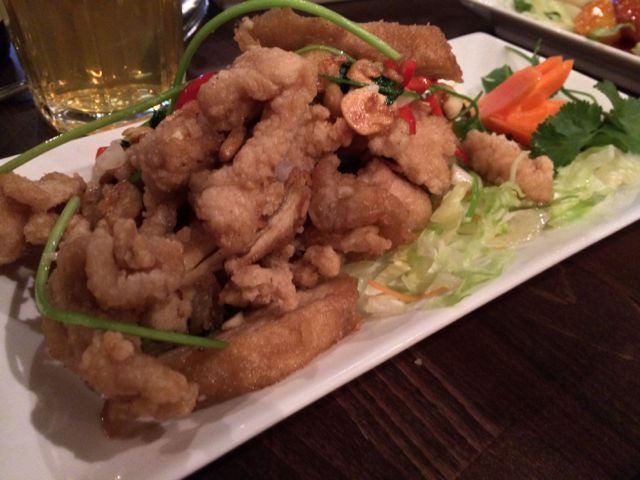 This entry was posted in Area: Colmore Business District, Cuisine: Chinese, Price: Average, Venue type: Cocktail Bar, Venue type: Restaurant and tagged Birmingham Restaurant, birmingham restaurant review, birmingham review, eating out in birmingham, Out In Birmingham, out in brum, OutInBrum, restaurant review, Where To Go In Birmingham. Bookmark the permalink.